Are you feeling nervous about your Cambridge Interview? Or that the interviewers will ask for something seemingly impossible? It is clear from our experience that there is a vast discrepancy in the amount of preparation candidates do before their interview. Some schools are very experienced with applications to Cambridge and provide a huge level of support to applicants. However the majority of schools are not familiar with the process, leaving their students at a huge disadvantage. We offer a range of free and premium services to give you the best change of getting into Cambridge. We know that the interview can seem a terrifying prospect. We work with students to improve their confidence and understand what to expect. When faced with questions like these, it can seem as if the interviewer is trying to trick you! With so many applicants with great grades, these questions provide the perfect opportunity for you to demonstrate your personality, creativity and thinking ability compared with everybody else. Every year we hear from students distressed about how to deal with these types of questions. 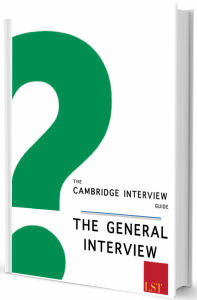 In response a team of Cambridge and Oxford graduates have worked to put together “Cambridge Interview Guide – The General Interview”. This guide will be available to download from November – enter your e-mail address below to receive the guide. 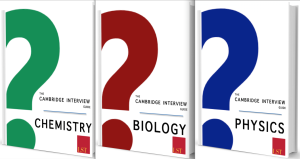 Each guide discusses ten Cambridge Interview Questions in depth with answers and approaches – along with possible points of further discussion to further demonstrate your knowledge. They have specially edited for applicants for each subject by a team of Oxford and Cambridge graduates. 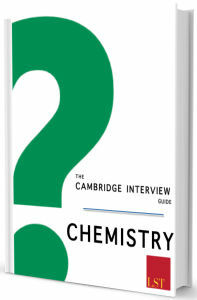 Please Note: Currently “The Cambridge Interview Guide” is available for Chemistry and Physics. Other subjects will be available for download in November – please enter your email below to be informed of the release date for your subject. Click below to receive your Cambridge Interview Guide right now and you’ll be sent it in PDF format by email the same day so you can begin your preparation right away! 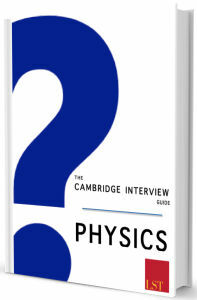 The Cambridge Interview Guides are available to download for only £30 each, or £50 for both Chemistry and Physics! Have you run out of ideas of how to show your enthusiasm and passion for your subject? Are you worried that an area of your personal statement might be picked on at interview? Our Interview Preparation session prepares students to talk about and discuss their subjects with confidence – as well as suggesting questions and readings beyond the syllabus.These sessions work on the skills required for a successful interview. Cambridge Interview Questions is also experienced providing support to schools – and our advisers would be happy to arrange interview preparation days for students. This service is also available online via Skype. The Mock Interview session is also available online via Skype.